Hakata was ai indipendent city for many centuries and is considered one of the oldest cities in Japan, a port city always very important in trades with the rest of Asia, due to its position. In 1876 it was annexed to the neighboring city of Fukuoka, and the name "Hakata" is still used today referring to an important district of Fukuoka city, east of Naka-gawa River. A large 10-storey shopping complex, built in 2011 just above JR Hakata station (the main railway station in Fukuoka). 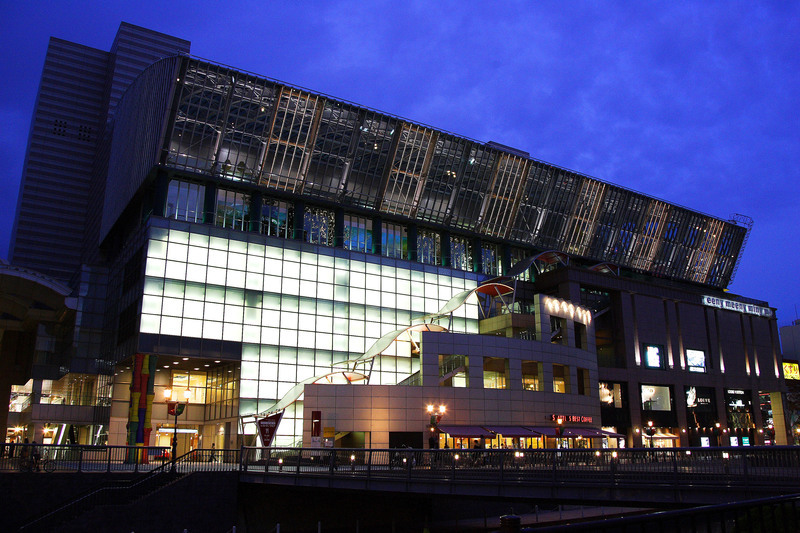 The complex includes a large shopping center with about 220 shops (Amu Plaza Hakata) and the only branches of the city of two famous Japanese department store chains (Tokyu Hands and Hankyu). On the 8th floor (8F) you can find the Fukuoka Pokemon Center, between the 9th (9F) and the 10th floor (10F) you can find a multiplex cinema (T-Joy Hakata) and 46 restaurants serving both Japanese and international food. On the roof there is a large terrace (Tsubame No Mori Hiroba), where it was built a small Shinto shrine dedicated to the protection of all travelers, and also you can enjoy a panoramic view of the city of Fukuoka (from a height of about 60 meters), the sea, and all trains in and out of the station. At this link (in English) a complete list of all the shops and restaurants of this complex. Gion is an area located less than 1 km north of Hakata station, once the heart of the old city of Hakata. Today it is an area full of modern buildings, but among these buildings can still be found a few ancient temples and shrines. 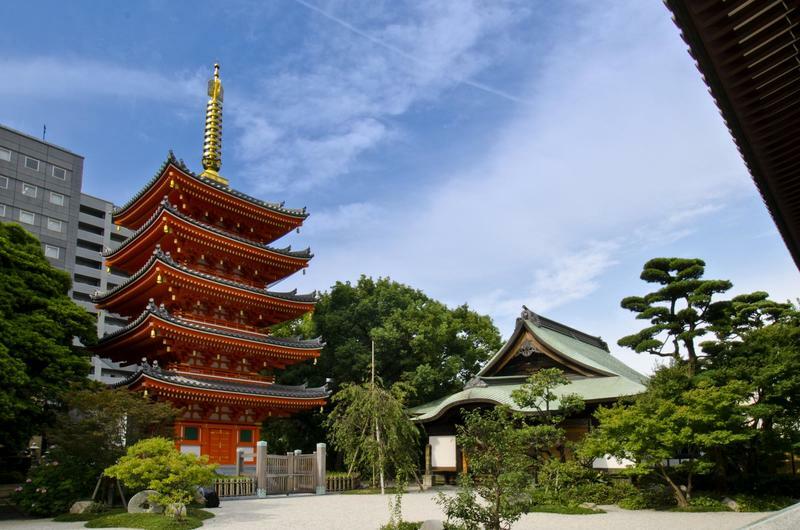 The most famous ones are the Kushida Shrine, the Tochoji Temple and the Shofukuji Temple. A small and ancient Shinto shrine, dating back to the eighth century, it is the most famous of Hakata. It is especially known for being the shrine of the Hakata Gion Yamakasa, one of the most interesting to see traditional festivals (matsuri) in Japan. 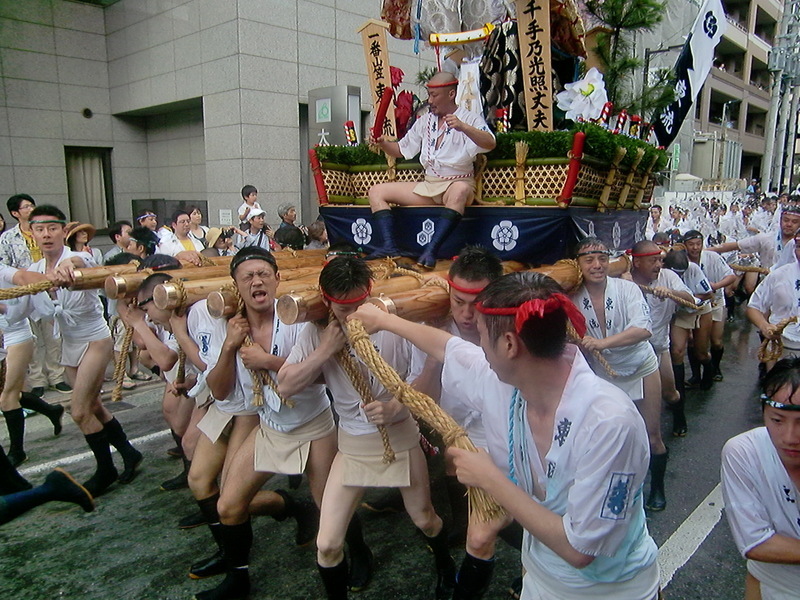 The festival lasts for about 15 days during the first half of the month of July each year, in which various events take place, and ends with a time trial between the various challenging floats. The starting point of this race is in front of the Kushida Shrine. A temple belonging to the Shingon Buddhist sect, among the oldest in the city and with a charming red pagoda of 5 floors. It became famous thanks to a Giant wooden Buddha statue, known as Fukuoka Daibutsu, carved between 1988 and 1992. It is the largest wooden statue depicting a sitting Buddha of Japan, with a height of 10.8 meters and a weight of about 30 tons. 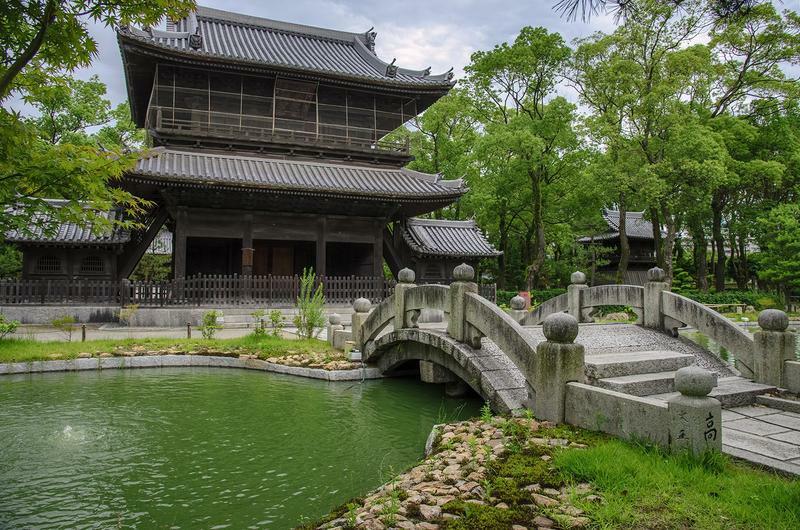 This temple does not have anything special for which it is worth a visit more than many other temples, however, it holds a very important record: It was the first Zen Buddhist temple to be built in Japan, in 1195. The buildings cannot be visited inside, but you can wander around freely at any time within the grounds of the temple. 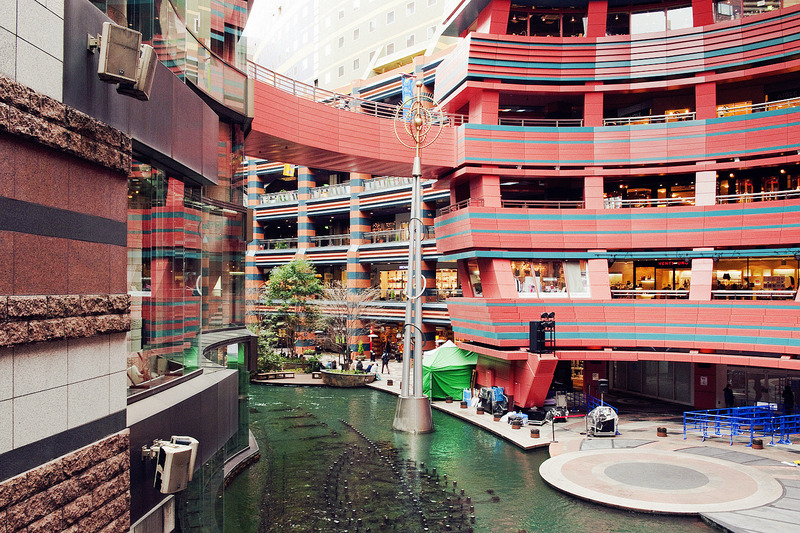 A commercial complex of five floors, located approximately 1 km to the west of Hakata station, and crossed inside by an artificial channel filled with water. Approximately at the center of the building there is a large fountain where, every half hour (from 10 to 22), it is performed a water show with music. 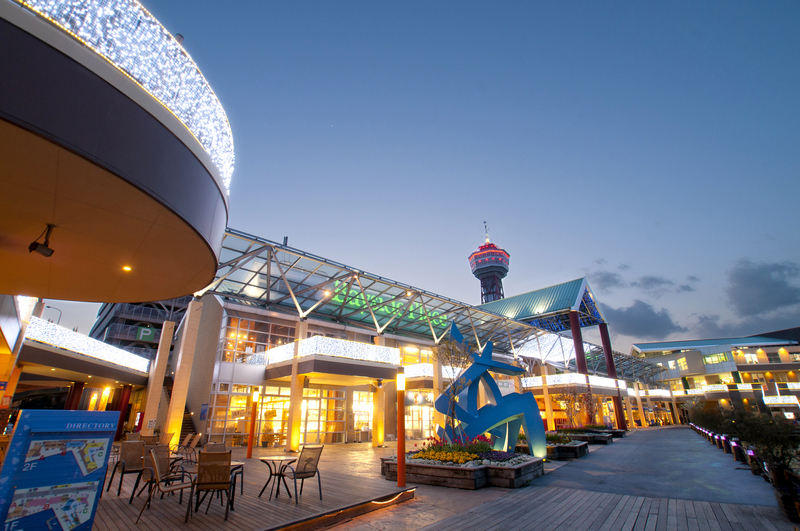 Within this really huge complex (it is almost certain to get lost), there are about 250 shops, a theater, a cinema, a huge game center (Taito Station), two hotels (Washington Hotel and Grand Hyatt Hotel), and endless dining options of Japanese and international cuisine. On the fifth floor, in particular, there is an area called Ramen Stadium, where to find a lof of ramen restaurants of several different styles. This place is very foreign-friendly, with signs in English and other languages everywhere within the center (and they also have a very good English website, which isn't a very common thing in Japan), within the whole complex it is also available free wifi. A commercial and cultural complex, which opened in 1999, which includes several buildings and places of interest: a 5-star hotel (Hotel Okura Fukuoka),an upscale shopping center with over 70 shops of the biggest brands in the world, an art museum (Fukuoka Asian Art Museum), a kabuki theater (Hakata-za. It is located a few meters from the subway station Nakasu-Kawabata. As the name suggests, it is an art museum exhibiting works by Asian artists of the last two centuries, in a building belonging to the Hakata Riverain complex. In addition to the permanent collection, this museum also hosts several temporary exhibitions throughout the year. A modern kabuki theater, part of the commercial and cultural complex known as Hakata Riverain. For information on show times and to purchase tickets, you must contact the ticket office at the theater. 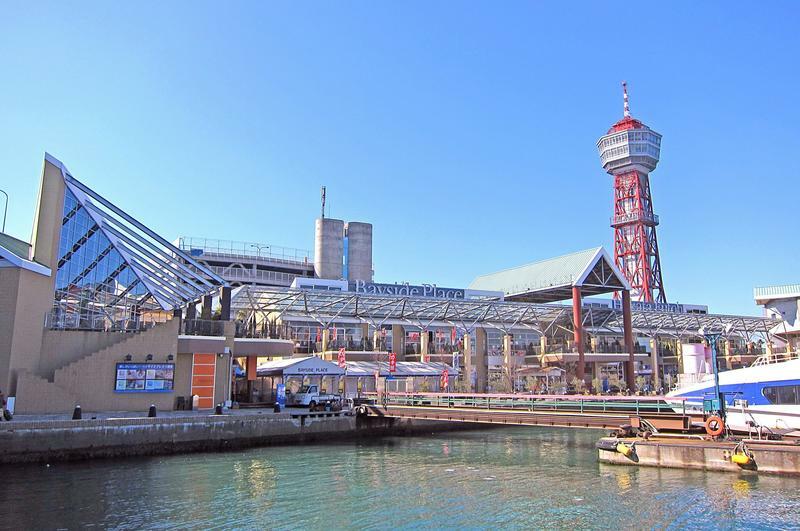 A commercial area on a pier (Hakata Pier) on the sea and directly connected to the passenger terminal of the port of Fukuoka (Hakata Port). The port offers daily connections with various neighboring islands and also with South Korea (Busan), by ferry and hydrofoil, so this area is very popular with foreigners, although almost all of them are Koreans. There are a few souvenir shops and restaurants, a duty free shop, a fresh food market (Wangan Ichiba), and a viewing tower (Hakata Port Tower). A tower built in 1964 by the architect Naito Tachu, famous for having built many buildings of this type in various cities in Japan, the best known of which is the Tokyo Tower. This tower is 103 meters. There is an observation deck at a height of approximately 70 meters that can be accessed free of charge, where to enjoy a beautiful view of the city of Fukuoka and the sea. At the base of the tower there is a small museum (free admission, 10-17) about Fukuoka Port. 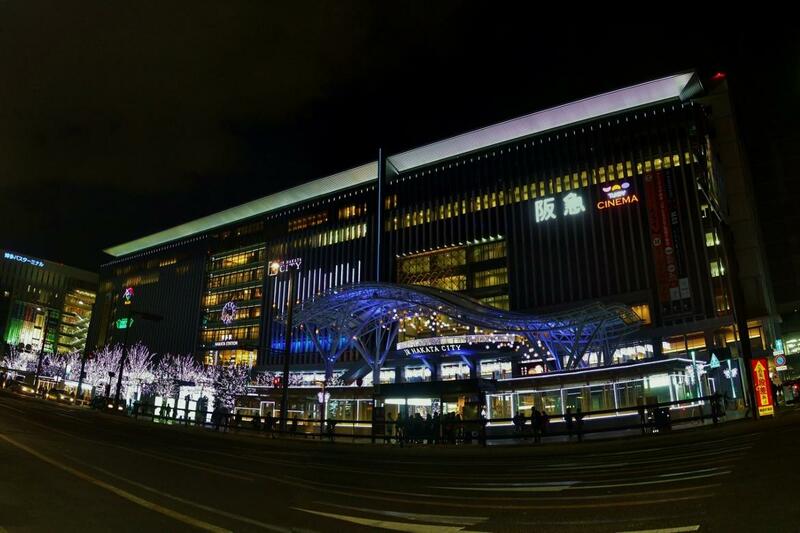 Hakata is one of the best areas to stay in Fukuoka, it is important to choose a hotel just a few steps from one of the metro stations in the area, preferably near Nakasu or Hakata station. For more tips check out the guide of Nakasu or the page Where to stay in Fukuoka. 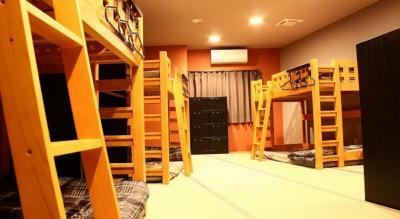 The best hostel in Fukuoka as for value for money, located near Hakata station. Impeccable cleanliness, kitchen and common room where you can meet other guests, complimentary tea/coffee and toasts every morning for breakfast. One night in a 10-beds dormitory costs 3,000 yen per night, there are also women-only dormitories and private double rooms from 7,200 yen per night. A business hotel located nearby the 'Hakata Riverain and the nightlife area of Nakasu, the rest of the city can be reached within minutes by metro. 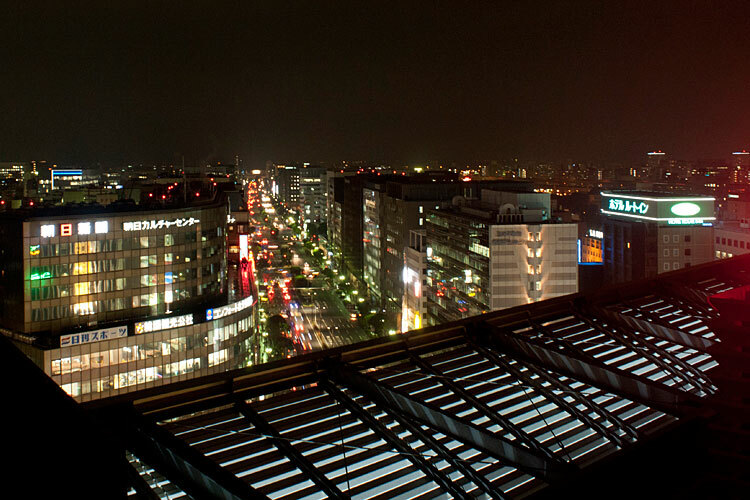 Nakasu-Kawabata station is located a few meters from the hotel. Small rooms but equipped with all the standard amenities for a Japanese hotel. On the ground floor there is an Irish pub (Hakata Harp) where breakfast is served: 1080 yen (set menu, not buffet), you can choose between japanese style and western style. 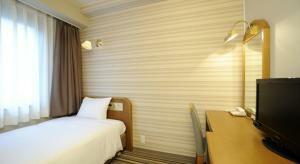 Single rooms from 5000 yen per night, double rooms from 7500 yen per night. If you are looking for a hotel without much expectation very close to Hakata station, this is probably one of the cheapest, just two minutes walk from the station. Single rooms from 5500 yen per night, double rooms from 6500 yen per night. Cheap breakfast (700 yen), but nothing special.. 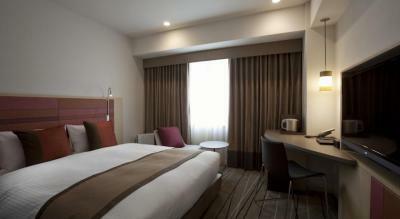 Fantastic hotel located a few meters from Hakata station. This is the best in the area as for value for money among the higher-end hotels. 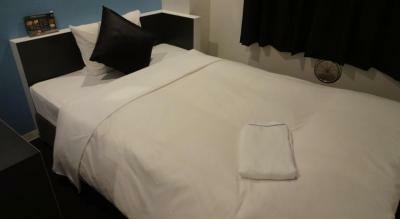 Large double rooms (20sq) from just 8400 yen per night single use, from 11700 yen for two people. The breakfast buffet costs 1300 yen per person and it is well worth the money. Fukuoka branch of the renowned international chain of luxury hotels Grand Hyatt, located within the shopping complex Canal City Hakata, a short walk from the island of Nakasu and the famous riverside full of street food stalls (yatai). Inside the building there are a fitness center, an indoor pool and two restaurants. 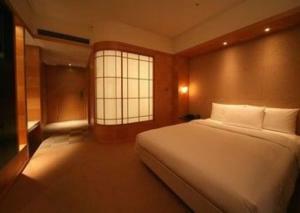 The most luxurious hotel in the entire city of Fukuoka. Double rooms of 27 sq from 18,000 yen per night on offer. Hakata station is the main station of Fukuoka, it is served by some JR local lines and above all by the Sanyo Shinkansen from Osaka and the Kyushu Shinkansen to Nagasaki and Kagoshima. This station is also served by the Kuko line of Fukuoka metro, thanks to this line you can go very easily, without changes, to the areas of Nakasu (3 minutes) and Tenjin (6 minutes), and Fukuoka airport (5 minuti). Gion station and Nakasu-Kawabata station are the next two stations to Hakata station along the Kuko line of the subway, and they are located respectively 800 and 1500 meters further north. You can reach any place described on this page in a few minutes walk from at least one of the three metro stations described above, getting around Hakata is really very easy, just look at the map, check the nearest metro station and go. If you like walking you may not even need to use the subway and explore the whole Hakata on foot. The greatest distance, between Hakata Station and the waterfront (Port of Hakata) is only 3 km.